We’ve now visited three cities in Scotland over the past few years: Edinburgh, Aberdeen and Glasgow. With every visit to the former two, we’ve been told “you need to go to Glasgow!” about the latter. Researching the city, we soon discovered why. 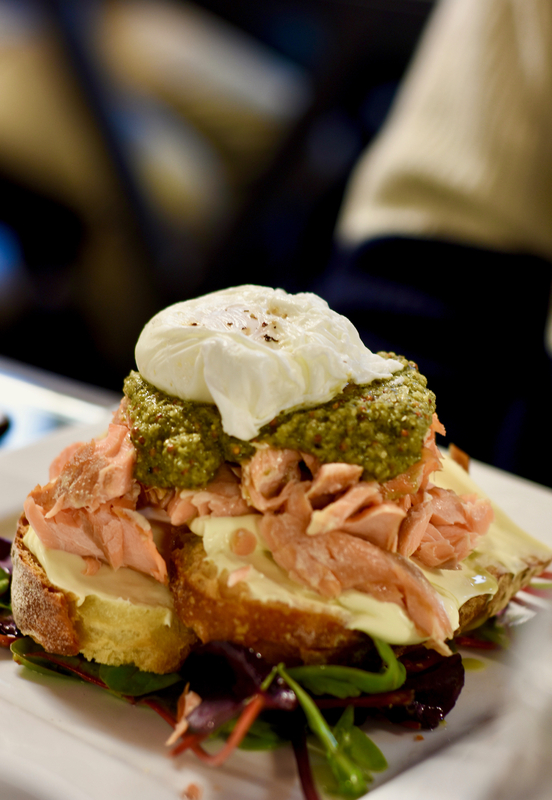 Scotland’s largest city, though not the capital, really is a paradise for food lovers seeking hearty feeds, local flavours, casual hangouts and proper hospitality. We’re not talking the stereotypes for food lovers, though there are plenty to choose from: Irn-Bru, Lasanga Pies, deep-fried Mars Bars. 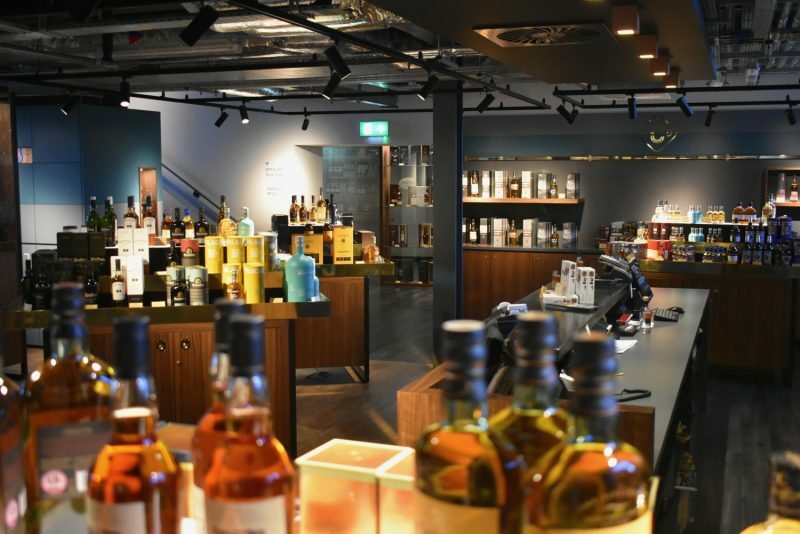 In a short trip to the city, you can get well fed on top-notch food, and drink the best whisky and beers that Scotland has to offer. 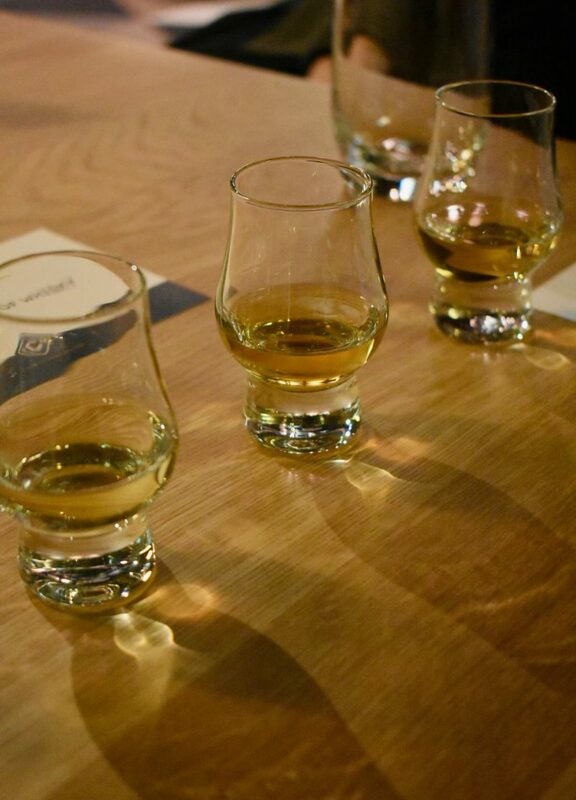 Scotland’s most famed export without a doubt is Scotch whisky. 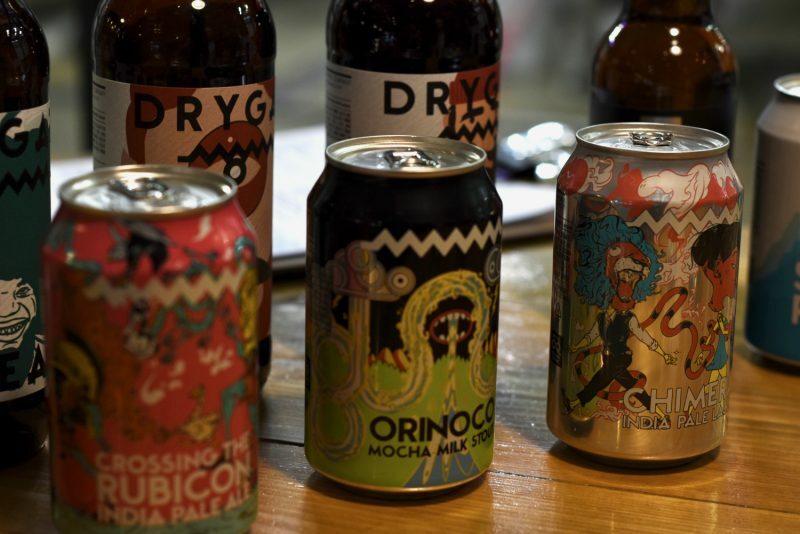 Sold and exported worldwide since the late 18th century, it’s still a booming industry which accounts for the vast majority of the UK’s food & drink export revenue. 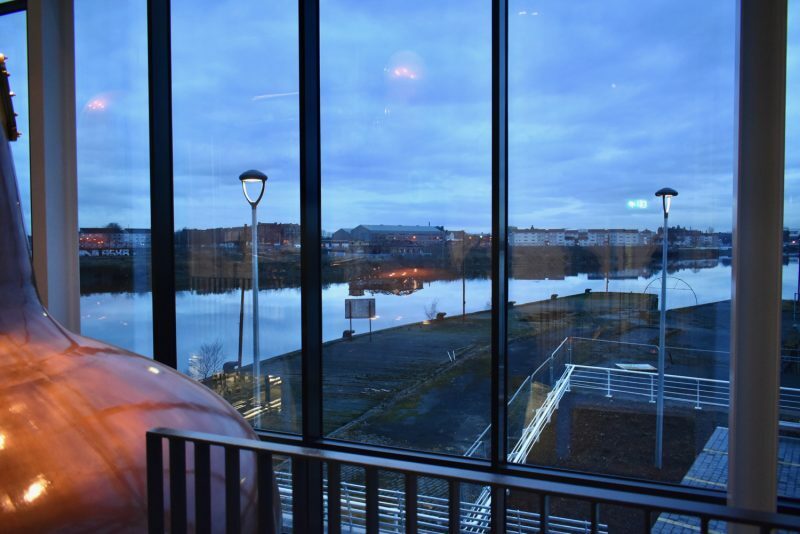 Clydeside Distillery, in the newly redeveloped docks area of the city, is a brand new distillery just shy of the heart of the city. 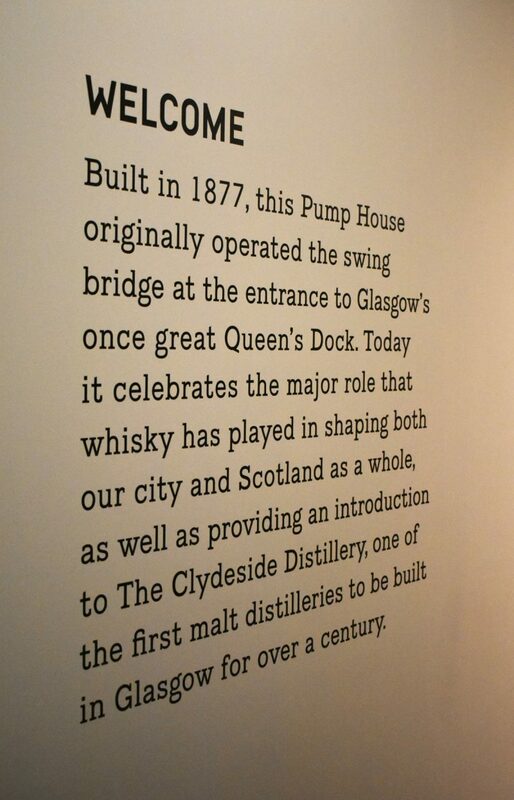 Having taken over the famous old Pump House in the Docklands, they’ve converted it into an interactive exhibition space and fully-functioning distillery, bestowing this almost forgotten part of Glasgow’s heritage a bit of modern glory. 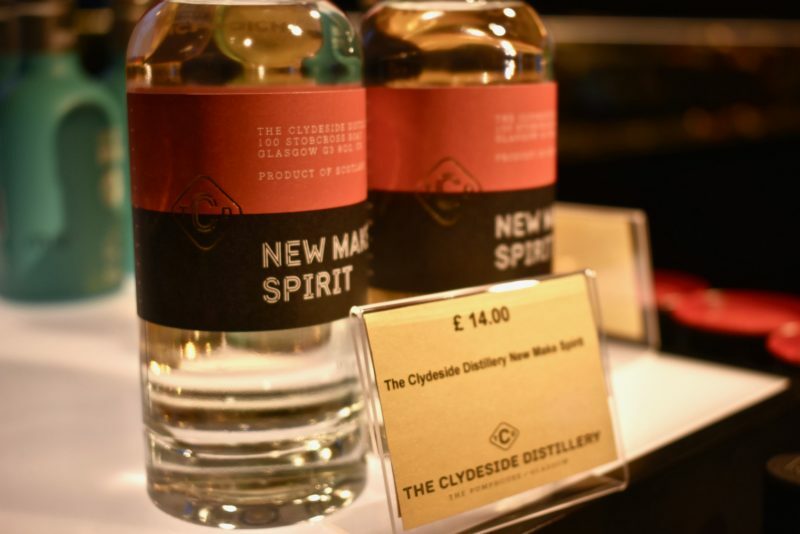 What’s curious, and some might say odd about here, is the fact that this distillery is unashamedly honest about the fact you cannot try it’s products. Want a sip? Well, you bloody can’t! And that’s a great thing. 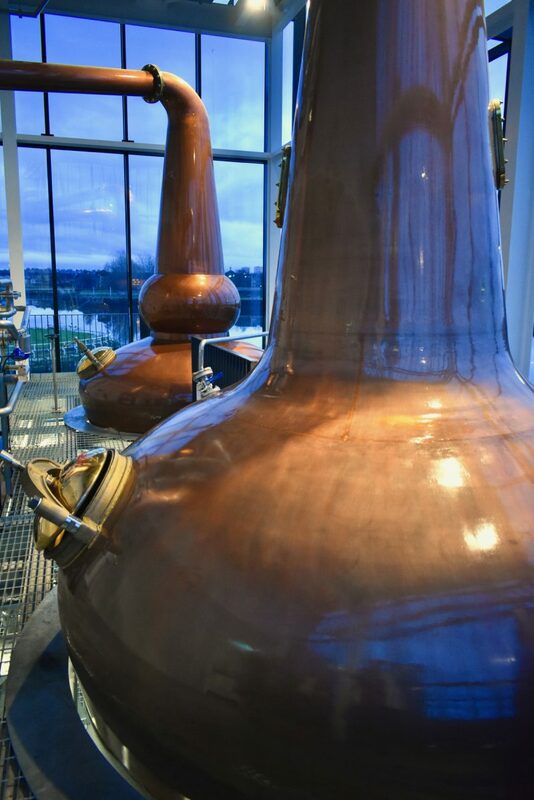 Hear us out: Scotch Whisky takes at least 3 years to age and to be legally labeled as such, and this distillery only opened in November 2017. Do the math – you won’t be able to try their own cut ’til 2020 at the earliest. Not resting on their laurels and turning a challenge into an advantage, the team have decided in the meantime to truly celebrate all varieties of Scottish whisky, where all brands from Speyside to the Highlands, Arran to Oban, are given a nod and noted for their unique properties and place in the history of this iconic local sip. 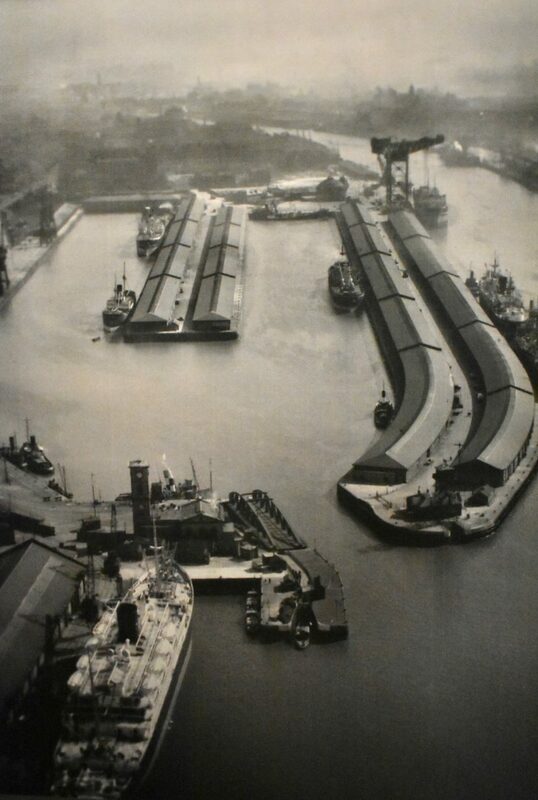 What does make here feel really special is that after visiting, you’ll be excitedly awaiting the launch and to try out what’s being made on the banks of the Clyde come 2020/21. 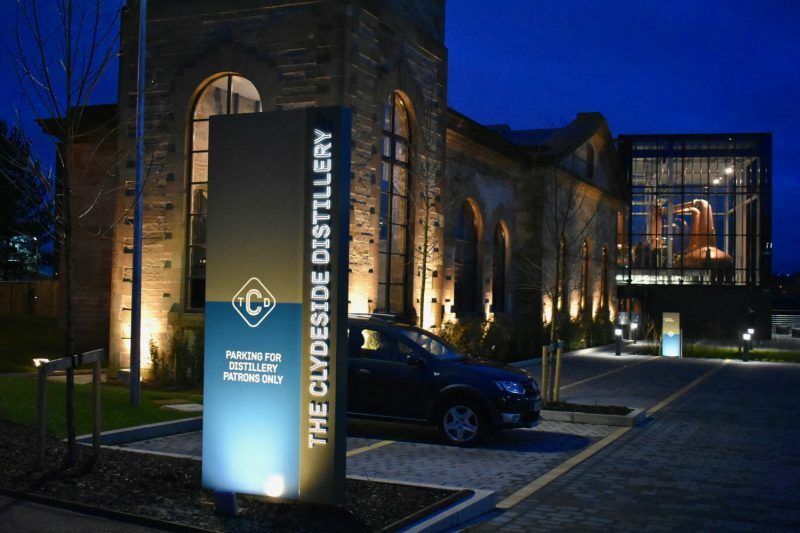 Visits to Clydeside Distillery are available daily, on the hour between 10am and last tour at 4pm and last 80 minutes. 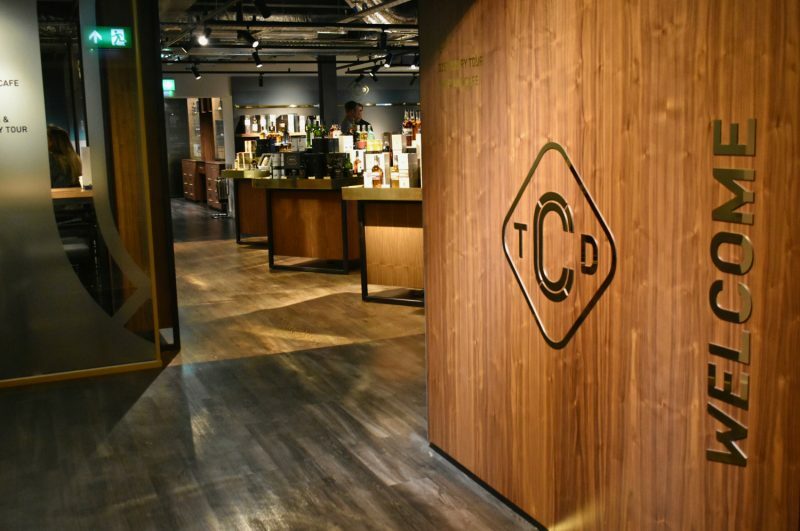 You are self-guided throughout a portion, where you discover the history of the building, of the industry before being shown the process of distilling, ending with the all important tasting session. Tickets are £15 (concessions £13, children over 8, £5). 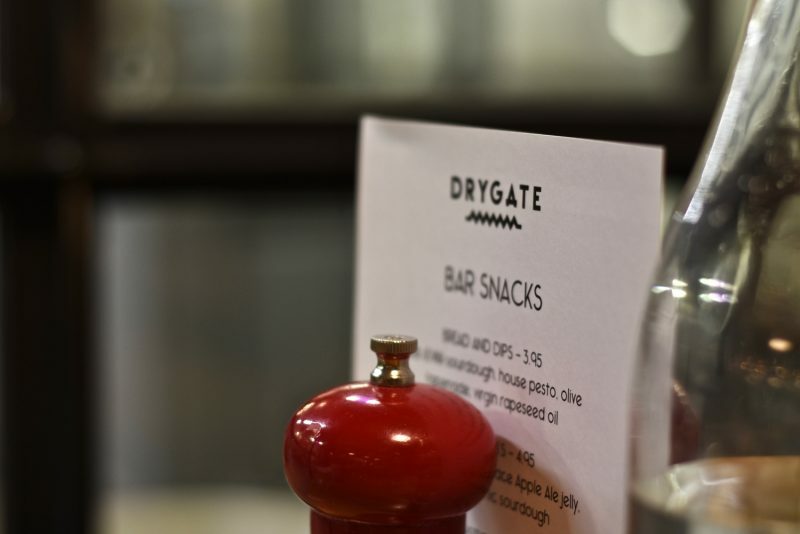 A cafe on the ground floor serves an excellent menu of the finest local produce and flavours- including an excellent value “Taste of Scotland” platter of cured meats, smoked salmon and cheese for £20 for a 2 persons sharing. Whisky not your thing? We’ve got another idea bubbling in our minds for you. 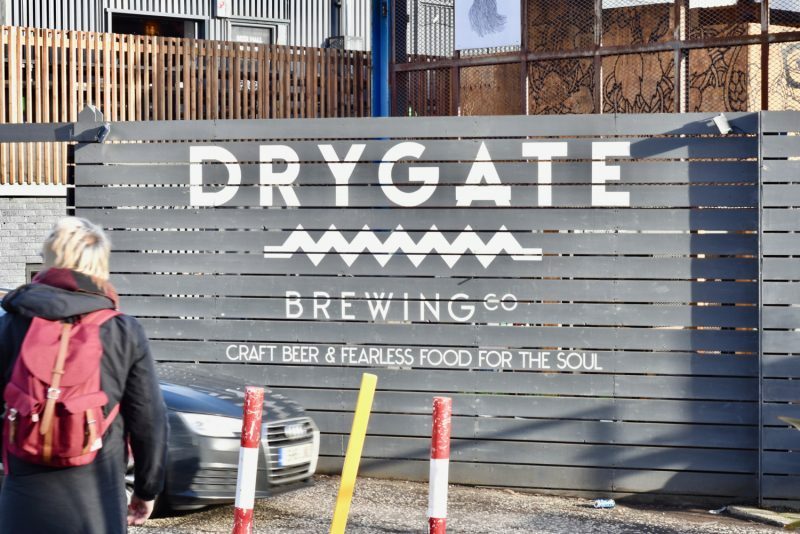 Visit the Drygate Brewery*. 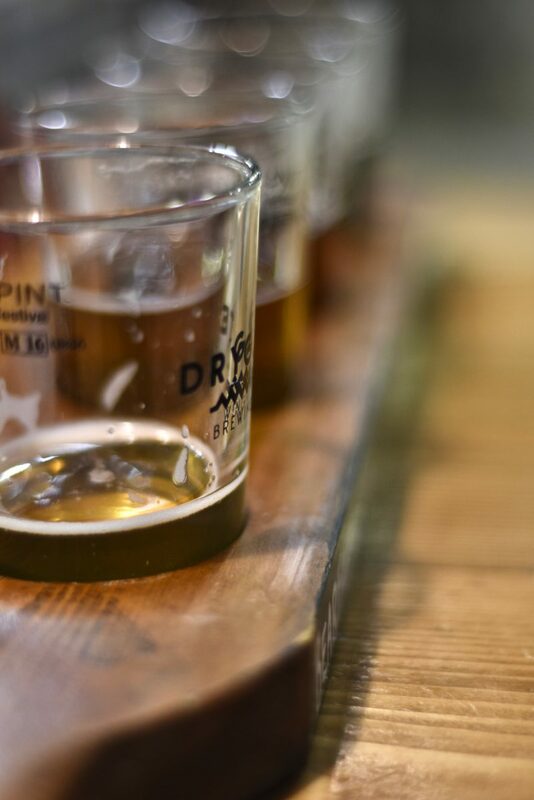 Located a stone’s from the city’s famous Tennant’s Brewery, this is Scotland’s first experiential craft brewery. What does that mean? 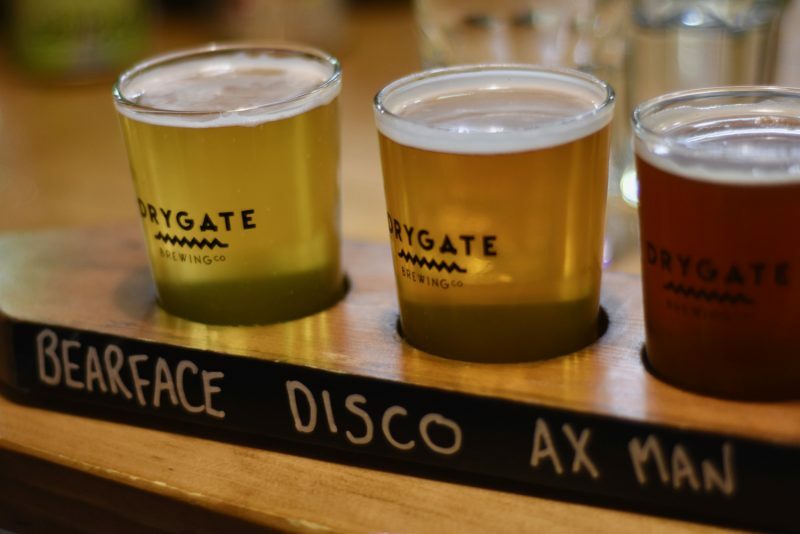 Basically, the brewers here are encouraged to be as inventive and creative as possible, and are given the freedom to be so – similar to what we enjoy at Dublin’s Open Gate Brewery. 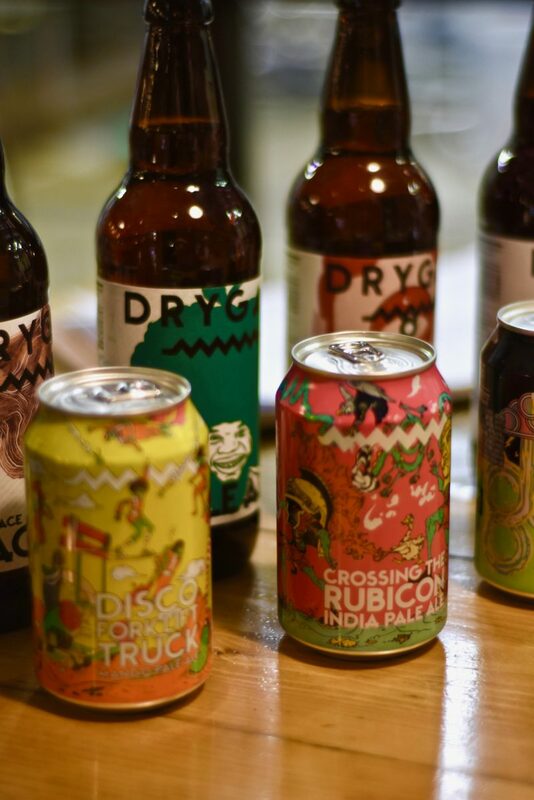 Drygate produces a wide range of brews, from a core line to some limited edition special editions of their beers, as well as a selection of some in bottles and some in cans. 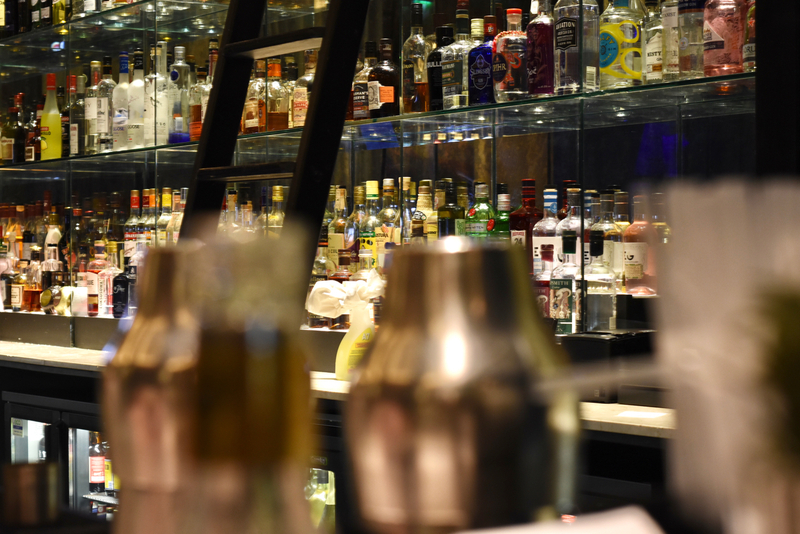 A casual way of experiencing the process is by going on their “Through The Glass” tour where you’ll watch the process from large glass walls within their bar/restaurant. 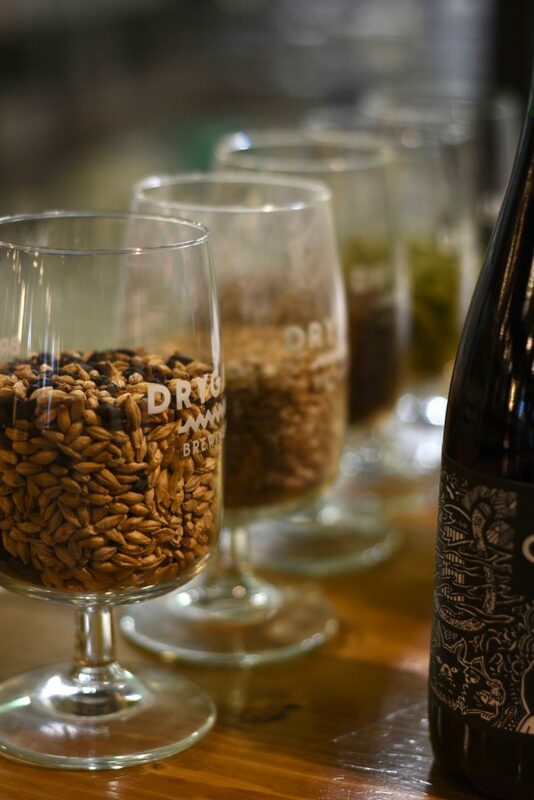 You’ll sample four of their beers and get a in-depth overview of what goes on in the brewery – with time to ask as many questions as you like! It costs an incredible value of £10 per person (only to those 18+, of course) and runs every Sunday at 1pm, 3pm and 5pm. 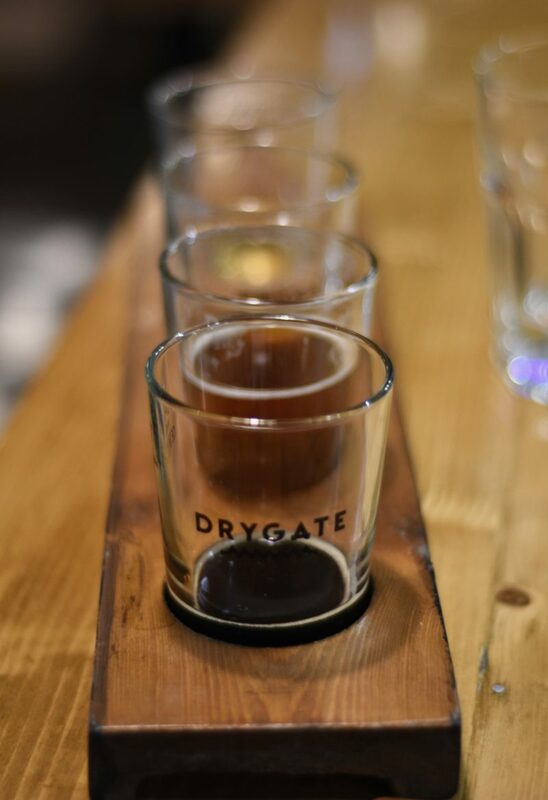 If that doesn’t suit you, it’s worth visiting the brewery anyway, and you can ask some of the staff in the restaurant or adjoining shop about what they’re doing and put your questions to them. 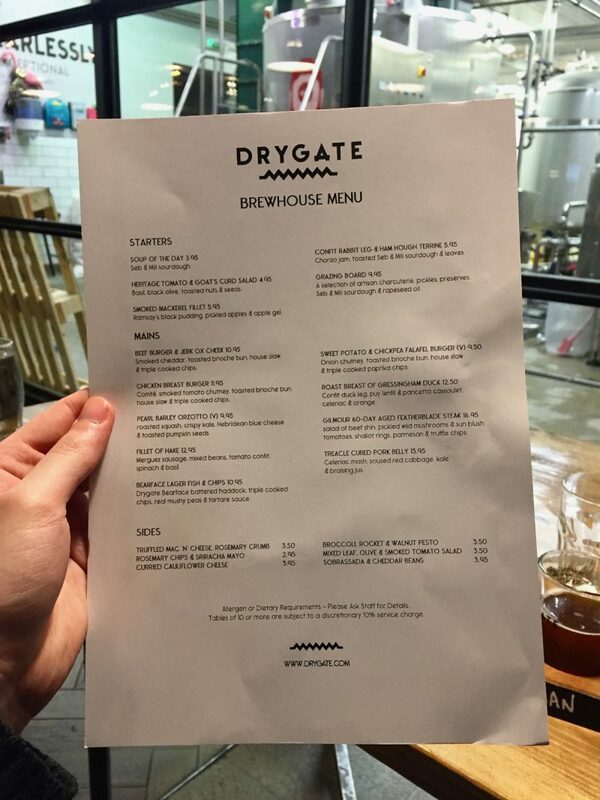 Their beer selection is fantastic (we were particular fans of their ‘Disco Fork Lift’ Mango Pale Ale and the ‘Orinoco’ Mocha Milk Stout which tastes like a milky, sweet and strong coffee), and food offerings were gorgeous – it’s the type of menu we were agonising over ordering from because there was too much great choice. 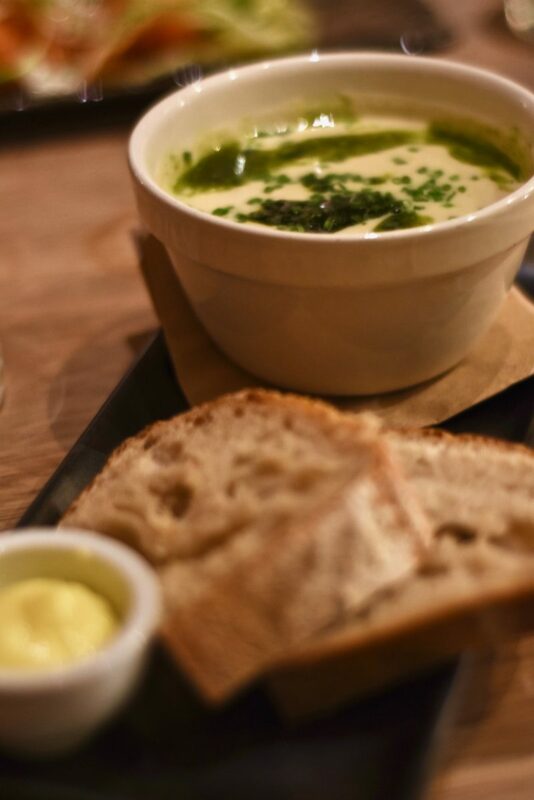 Whatever you do, try eat something that comes with the sourdough bread. 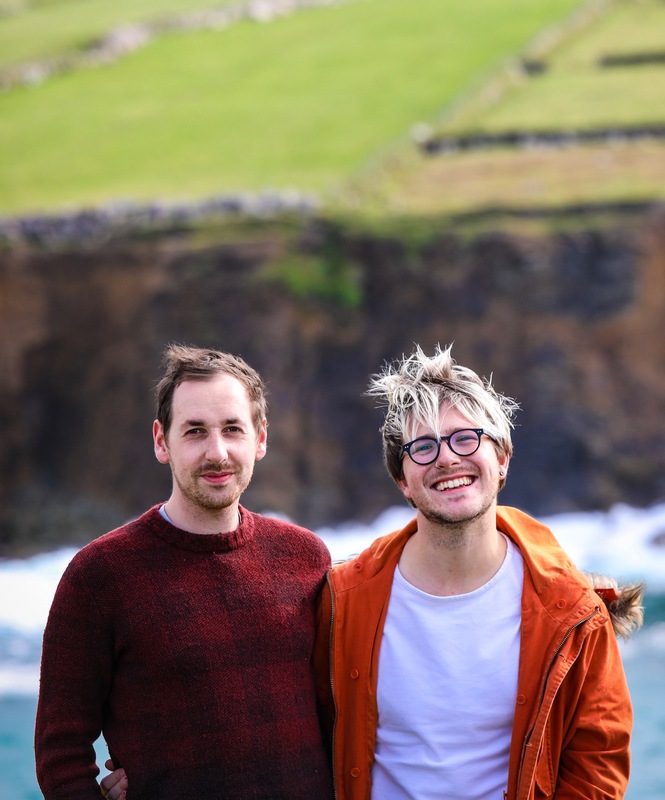 The spent grain from the process is taken by local bakery Seb and Mili, and baked into their sourdough loaves, giving it a distinct brewer’s flavour that we frankly couldn’t get enough of. A fabulous way to spend an afternoon! With all this talk of drinking, we need a G&T. 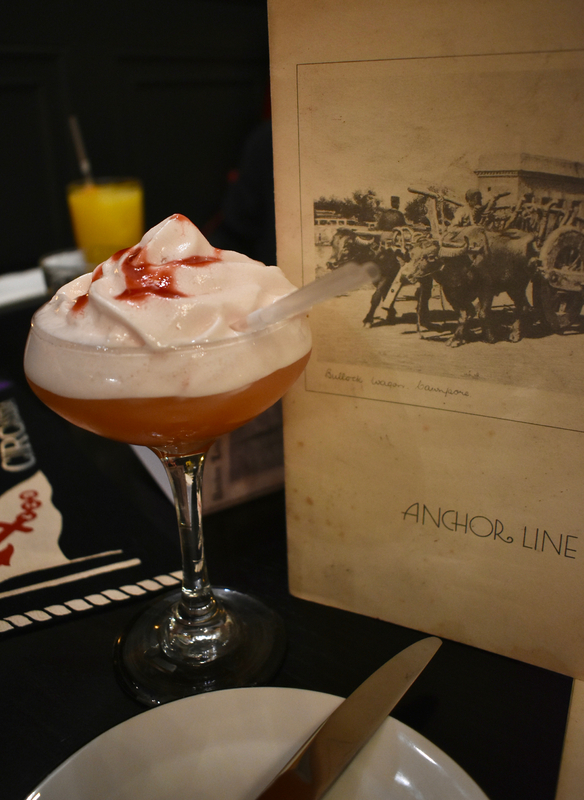 On another night we made a bee-line for The Spiritualist – a gorgeous destination bar literally steps from the Ibis Styles where we were staying at as guests of PeopleMakeGlasgow. The Spiritualist first draws you in with its stunning interiors and then slaps you figuratively in the face when you spot the floor to ceiling wall of spirits behind the bar. 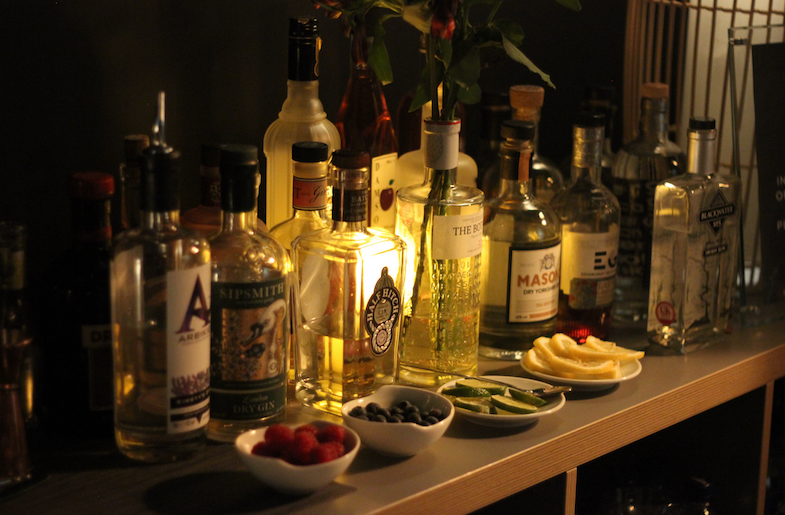 We were in absolute gin heaven and had serious trouble deciding on which two we’d treat ourselves with. In the end, we went with a double Daffy’s and Brockmans each. 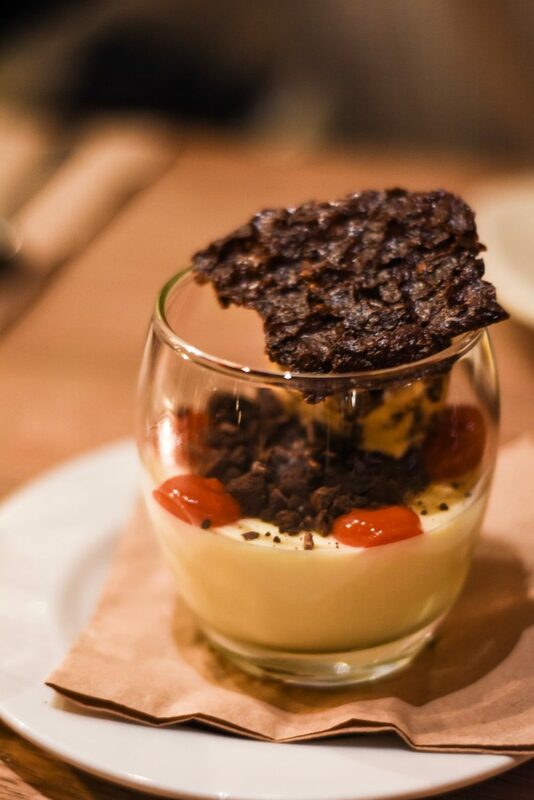 Perfect night cap material, right here. As with many of our trips around the world, we ask our followers to give us suggestions and tips of places to eat and drink. We were inundated with suggestions and tip offs, so much so, we’re already planning our next trip. 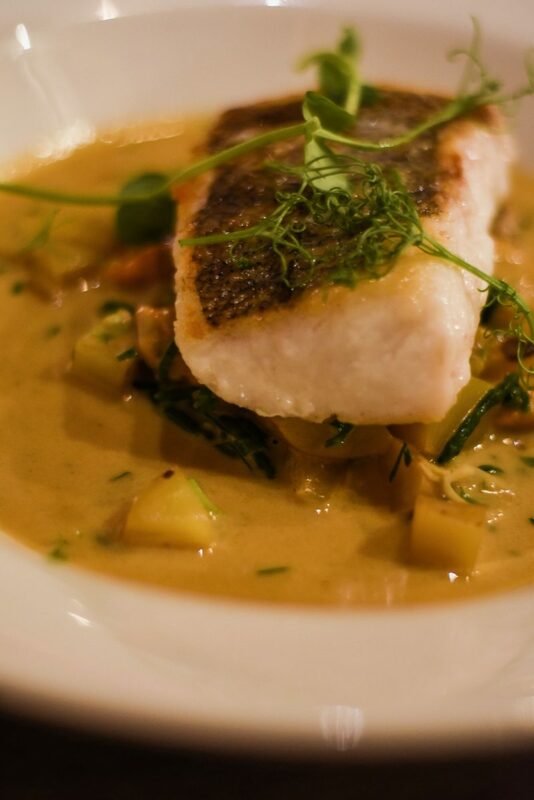 Many of the best restaurants in Glasgow reflect the flavours of Scotland, embracing the fantastic local produce available to them. 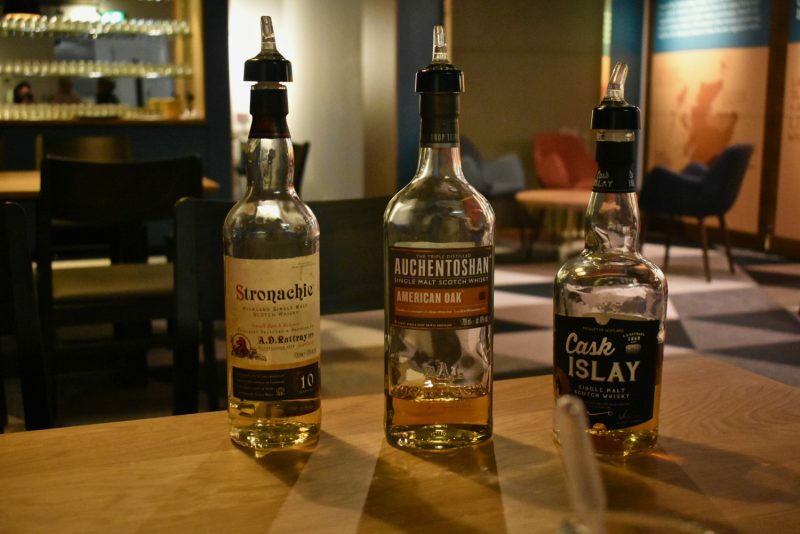 We were lucky to be invited to visit the city of Glasgow just in time to celebrate Burns Night, and we ate in The Gannet*, an incredibly popular local bistro in the Finnieston area of Glasgow’s West End*. 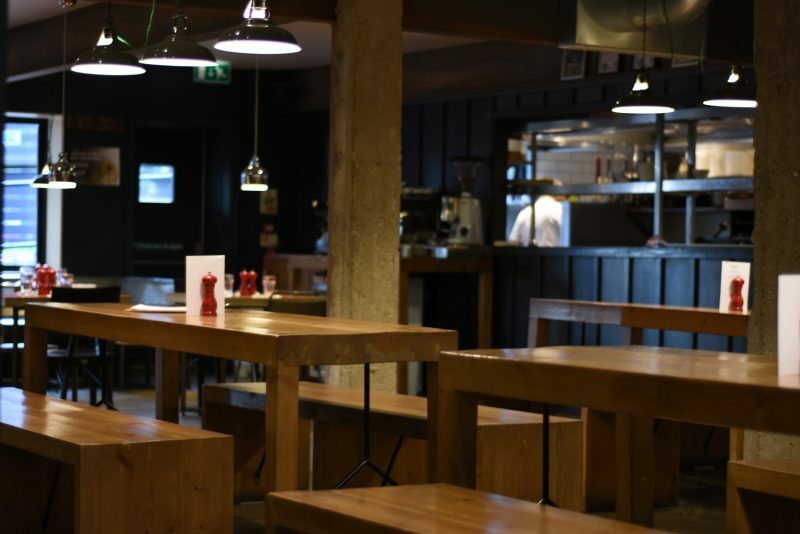 Opened in 2013 in a space that was left derelict for over a decade, the trio of friends who own the restaurant have created a wonderfully grown-up space with elegant details offset by industrial elements, where the menu treads the boards between fine and casual. Well worth booking a table and trying this place out! 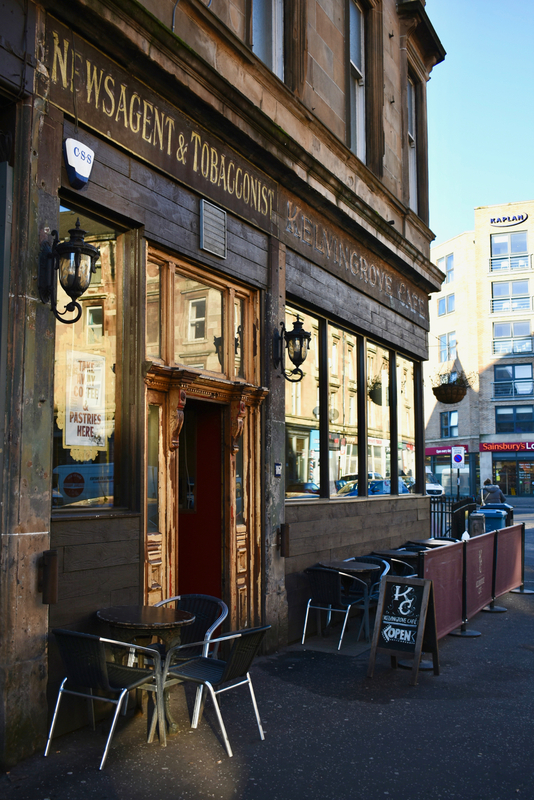 Right next door is Kelvingrove Cafe, recommended for being both great for breakfast in the morning, and excellent for drinks late at night. We opted for the former, and really enjoyed a black pudding hash as well as an Eggs Benedict style dish with, you guessed it, even more black pudding. Old pub style vibes with a hipster twist. 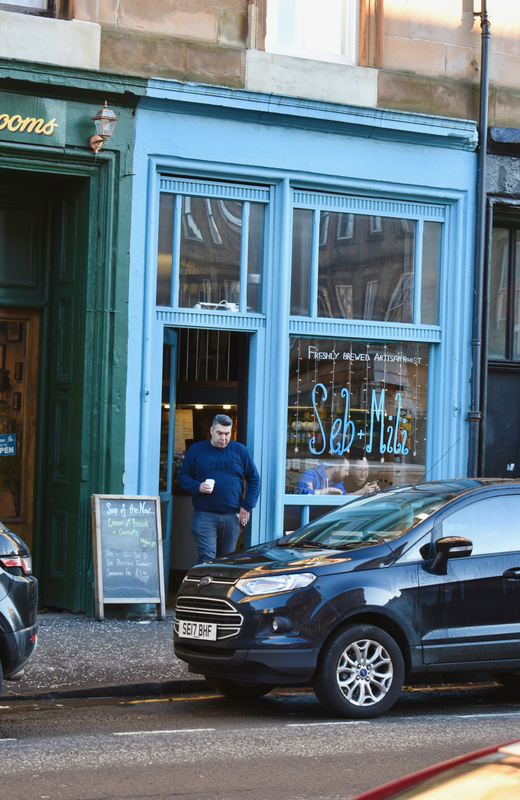 Across the road is a branch of Seb and Mili cafe and bakery, where the bread is made with the Drygate Brewery’s grain. 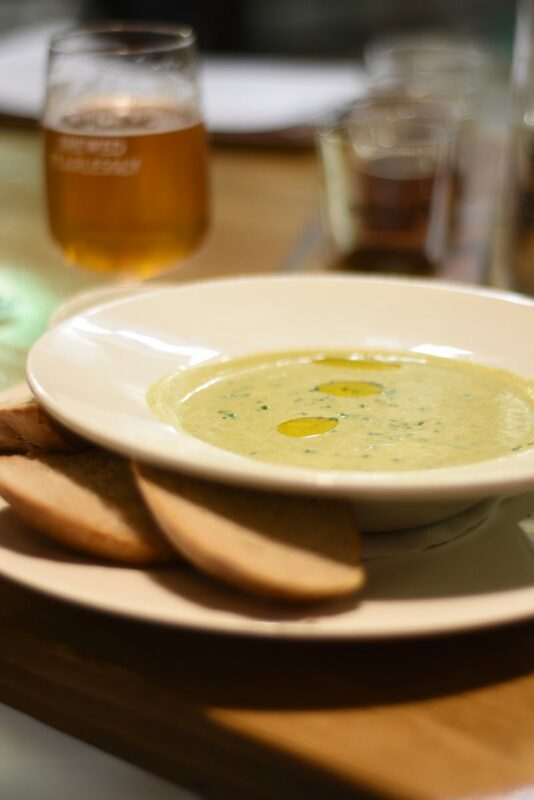 Two other places nearby which came highly recommended include Crabshakk and Ox & Finch. Crabshakk is quite a small space with a stunning marble bar and counter, where they specialise in bubbles and shellfish. Ox & Finch was top of plenty of suggestion lists. 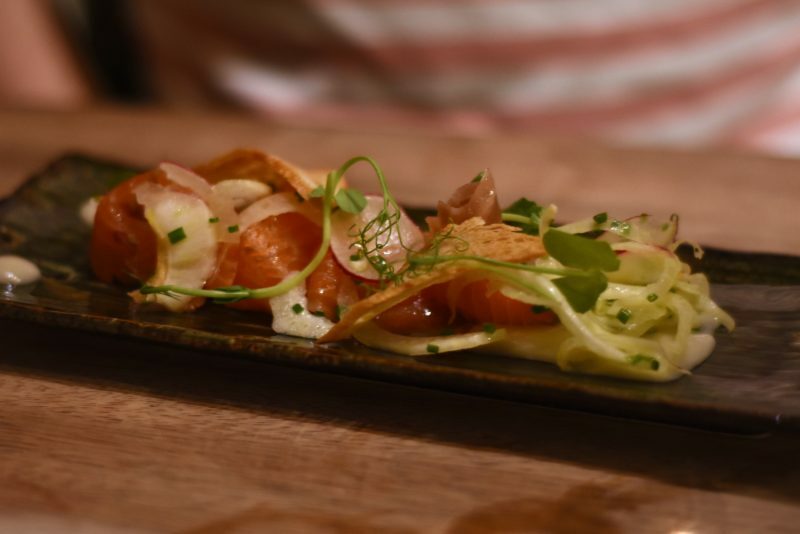 Instantly the menu reminded us of one of our favourite places to eat in Dublin, Etto– simple, small plates kind of vibe and a great place for casual dining. One of the most iconic restaurants in Glasgow, highly commended by local and national critics too, is The Ubiquitous Chip*. 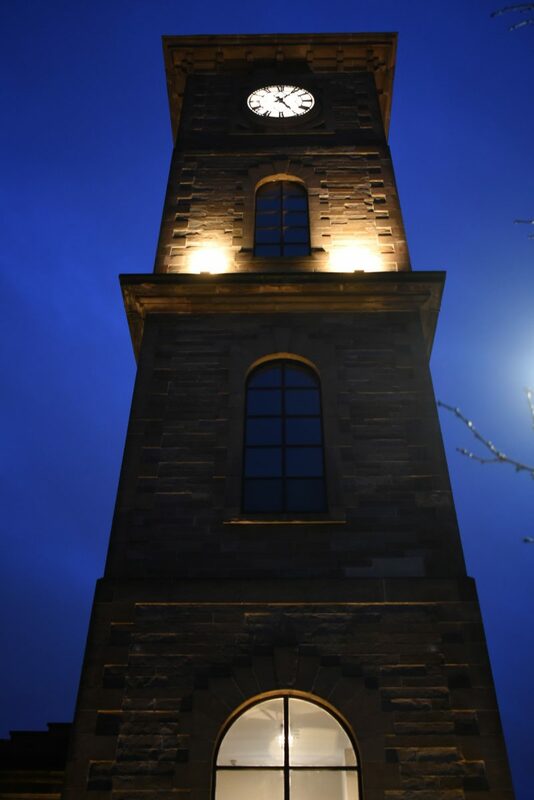 On the cobbled backstreet of Ashton Lane – a trendy cluster of clubs, bars, pubs and restaurants – this spot is a long-standing pioneer in changing the dining scene for Glaswegians. With a traditional old-school bar attached, you’ll also find incredibly unique interiors including it’s own indoor water feature. It’s really a unique place to dine in Glasgow. 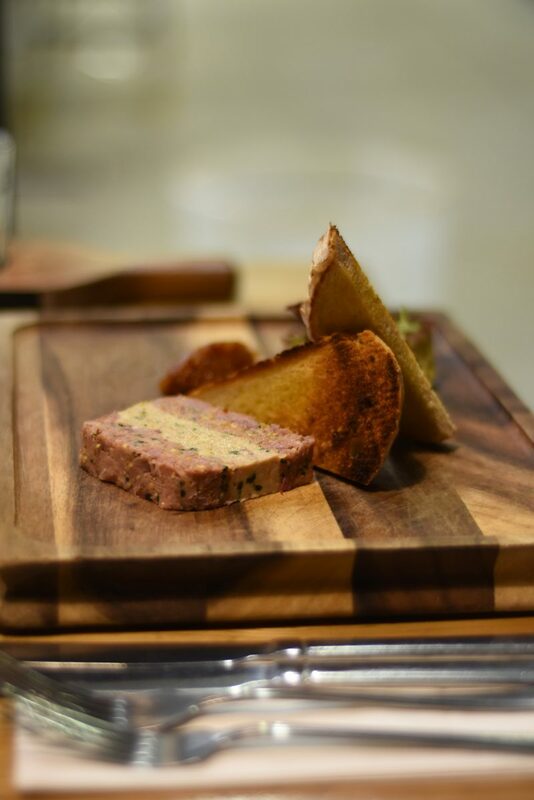 You’ll be treated to a hearty feed with just a whiff of elegance to it. While the option of the fine dining restaurant is available we were invited as guests* to the more casual brasserie. 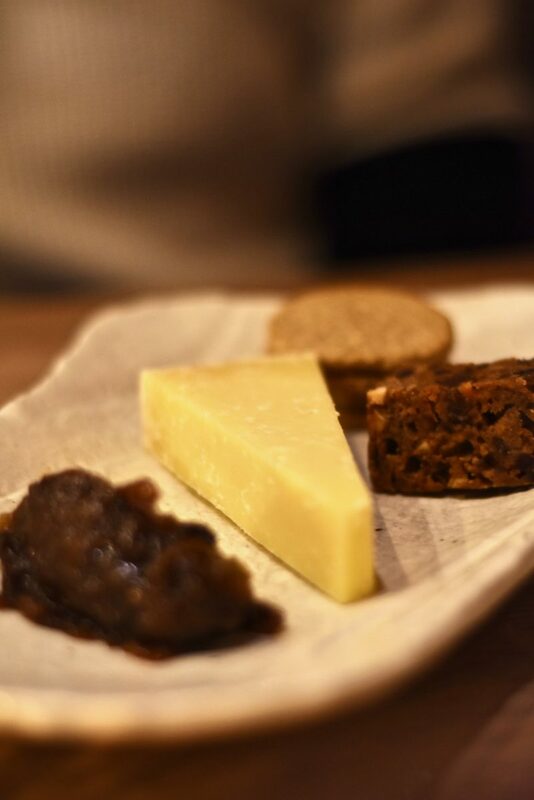 The menu features dishes such as venison haggis; Shetland mussels; as well as salt baked celeriac with mushroom ketchup. You’re in for a treat. 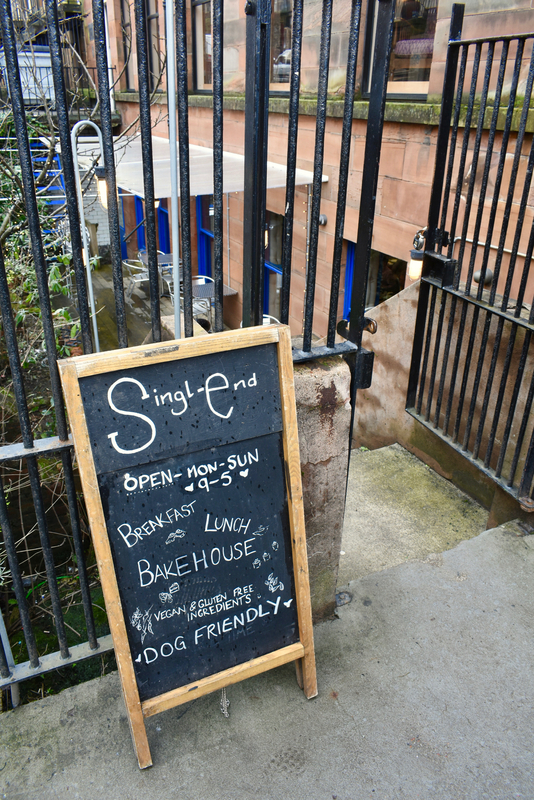 We were lucky enough to squeeze into a tiny two-person table at Singl-End* – Glagow’s best brunch spot – on our last morning before dashing to the airport. 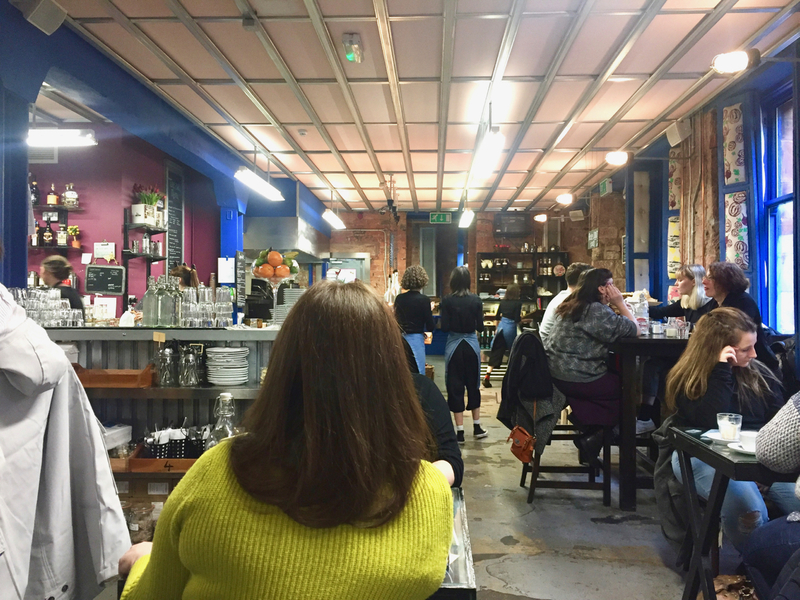 Luckily we pre-booked (which we would encourage you to do too) because for a Saturday morning it was absolutely jam-packed with young students, small families, groups of friends and hoards of foodies alike. 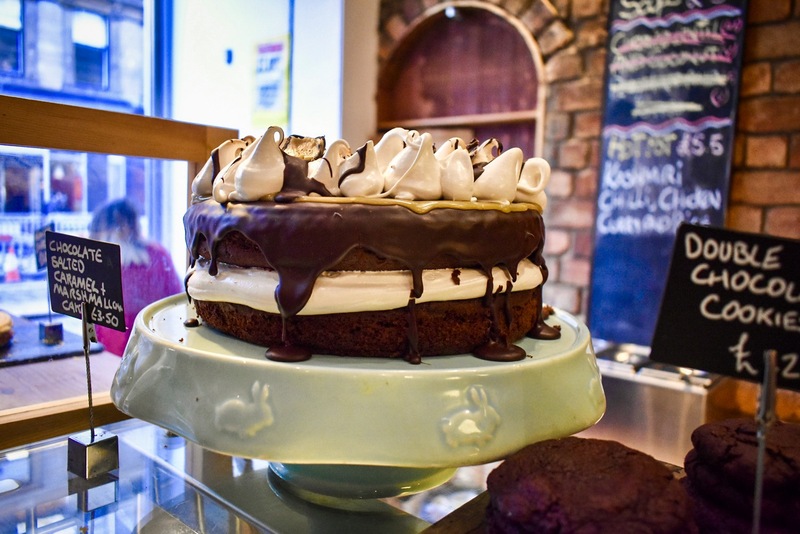 There are about 40 tables in this basement restaurant, bar and bakery on Renfrew Street and if you’re not tempted for brunch, you’ll certainly be tempted by the vast array of cakes and sweet treats on the dessert table just inside the door. 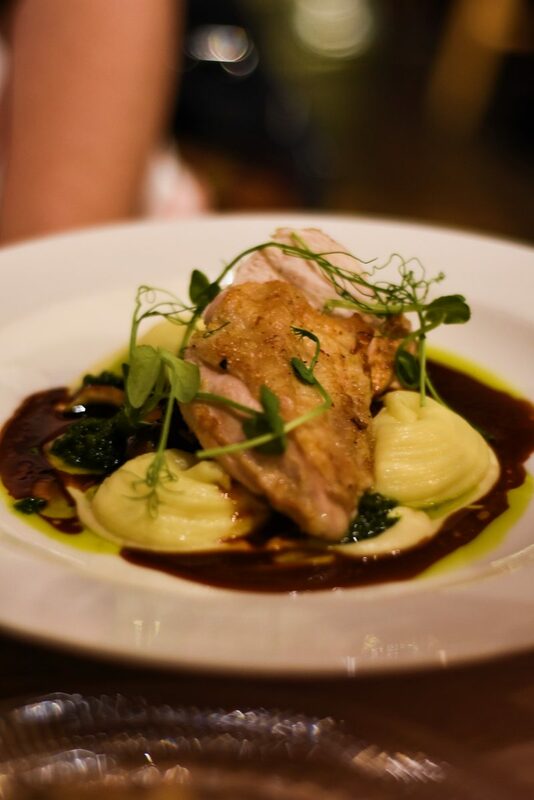 Passionate about good, honest food and supporting the local community, this place has serious heart and the food is serious too – we were mightily impressed with the variety on the menu. 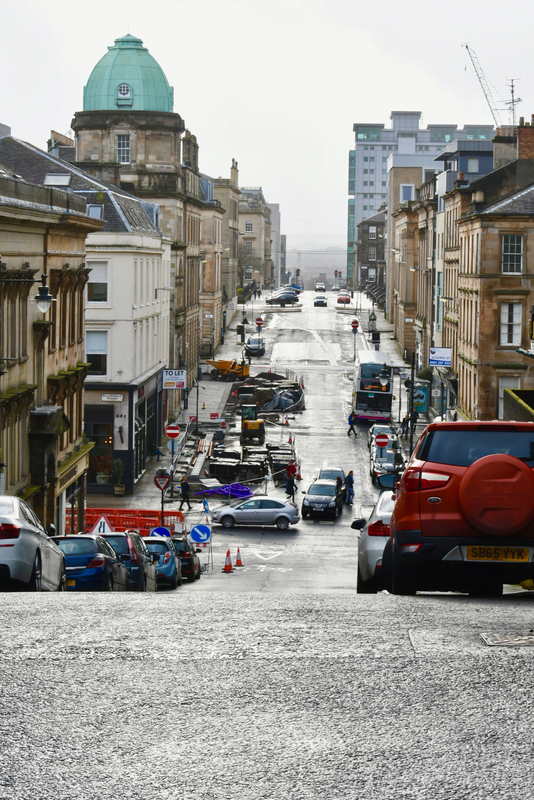 On one of our mornings in Glasgow we had the real pleasure of jumping in one of one of local journalist and tour guide Andrea Pearson’s Glasgow Walking Lunch tours. 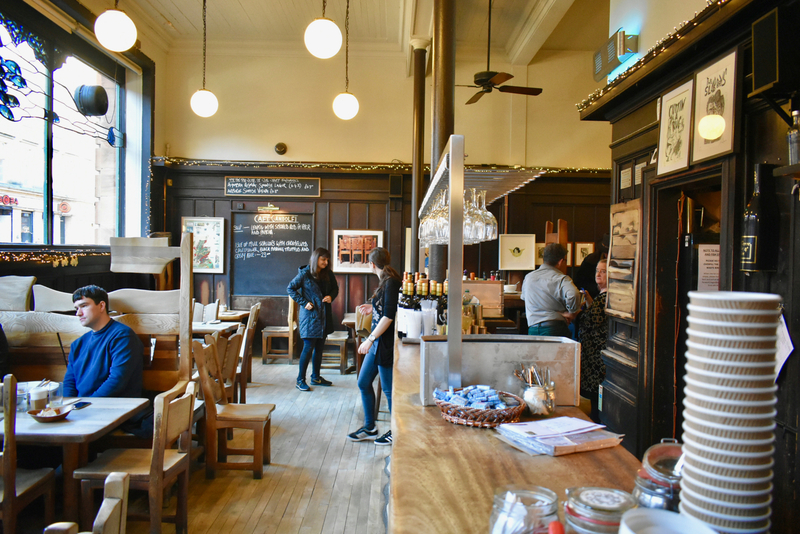 A two to three-hour stroll around the city, combining history tidbits, restaurant visits and meeting some locals along the way telling the story of both Glasgow and its food. We stopped by the likes of McCune Smith for soup and a chinwag, Gandolfi for deep-fried black pudding and a tour around their amazing restaurant and bar, famed local hotel The Anchor Line for cocktails and a cheese board in their destination lounge before finishing up with local roastery Dear Green coffee and some cake at Riverhill cafe. In each stop, one of the team hosts the tour and tells a little more about their space and how they contribute to the shape and sphere of Glasgow whilst Andrea leads everything in between, personally guiding you along Glasgow’s streets and we adore these kind of tours, so it was a real privilege to be able to embark on one. Andrea organises these tours monthly (usually first Saturday of each month) and on an ad-lib basis when demand is higher. Places are £35 per person and you can book on by emailing Andrea. You can follow Andrea on both Twitter and Facebook too for her latest updates. 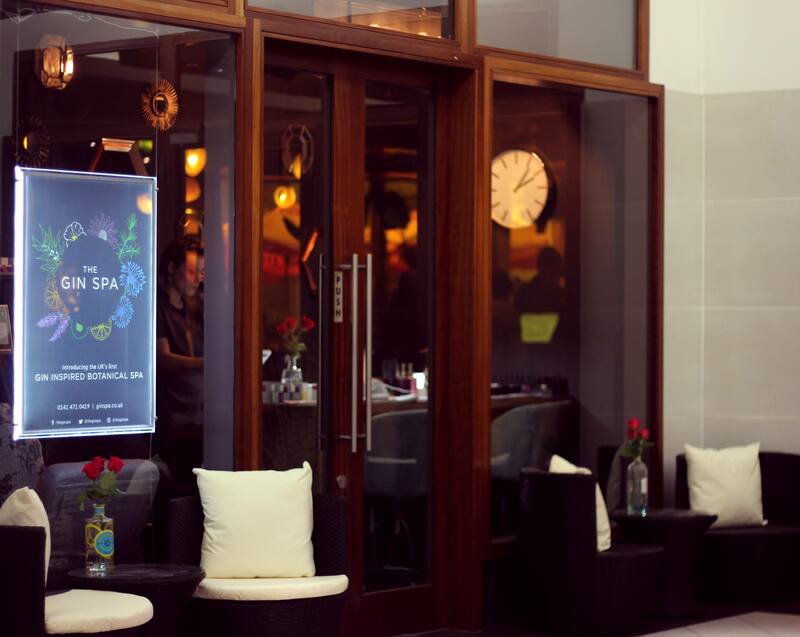 We visited the Gin Spa*, which was only open a couple of weeks when we arrived, and which instantly piqued our attention as the first botanically-focused day spa in the world. 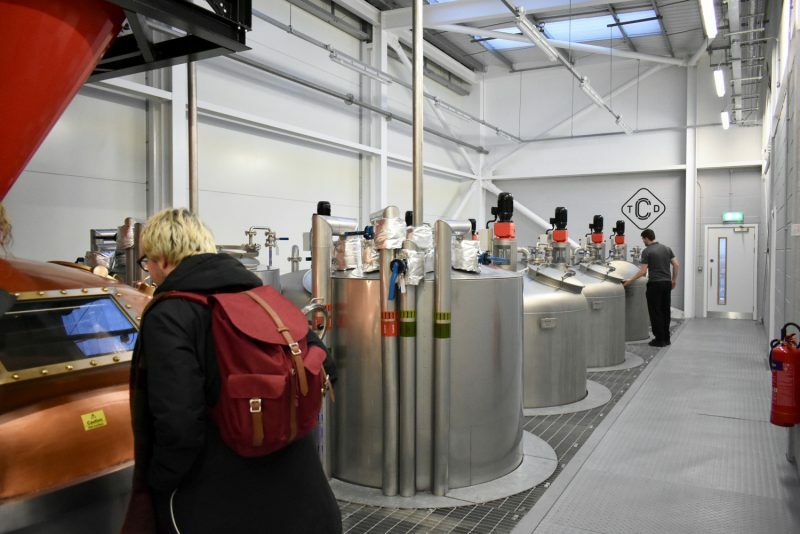 The idea is that everything is underpinned by gin, so the treatments use gin-like botannicals and the smells and flavours are all inspired by gin. 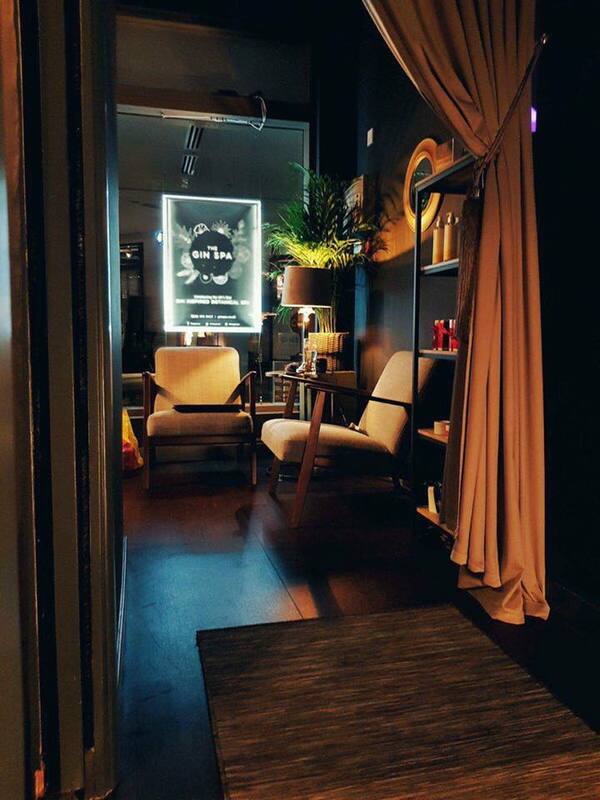 Set in the Merchant Quarter of the city, it’s not the lounging-by-the-pool or pruning in the jacuzzi type spa, this is all about massages, facials and body treatments – whilst a gin from their well-stocked selection, paired with a premium tonic, will be waiting for you afterwards. It’s small and the service is so friendly and personable, tailoring to your needs and how you want to ‘feel’ afterwards, whether that’s energised and active or tranquil and relaxed. For us pair of gin lovers, it was total bliss! Not what we were expecting, but definitely a unique experience and always good for a spa to go a little niche and stand out. On another day we visited the Riverside Museum, which is actually the name for the transport museum. A little confusing, but you’ll get used to it. 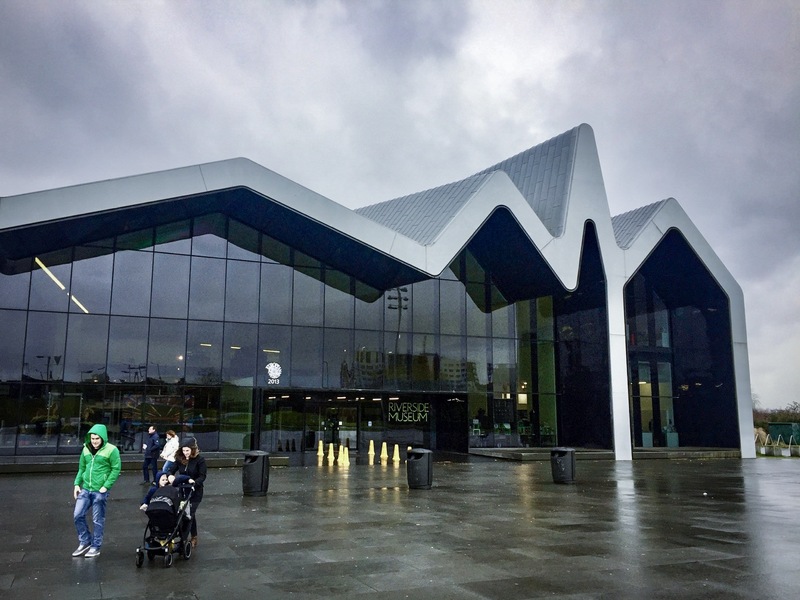 This award-winning museum, named European Museum of the Year in 2013 and designed by the late Zaha Hadid, displays within over 3,000 objects, everything from skateboards to locomotives, paintings to prams. 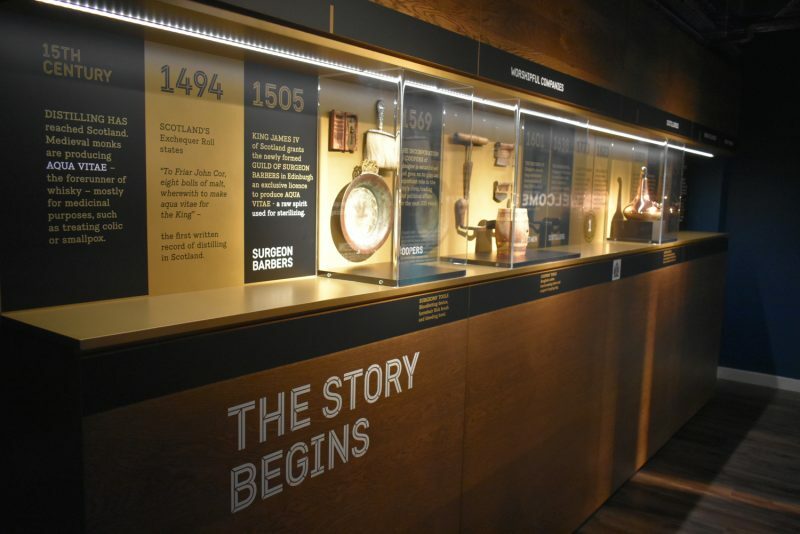 You’ll travel back in time and walk along the cobbled streets of a life-size recreation of a typical Glasgow street of yesteryear and you’ll also learn about all the methods of transport that have punctuated Glasgow’s streets – and beyond – in a thoroughly enjoyable hour or two’s visit. 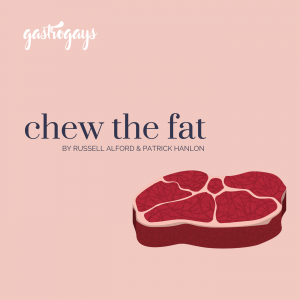 Highly recommend it – and it’s totally free! Travelling by rail to the city from other parts of the UK, including on the overnight Caledonian Sleeper from London, you’ll arrive in Glasgow Central station which, as the name suggests, is centrally located in the heart of Glasgow, but also well connected by the national rail network which spreads throughout the city. 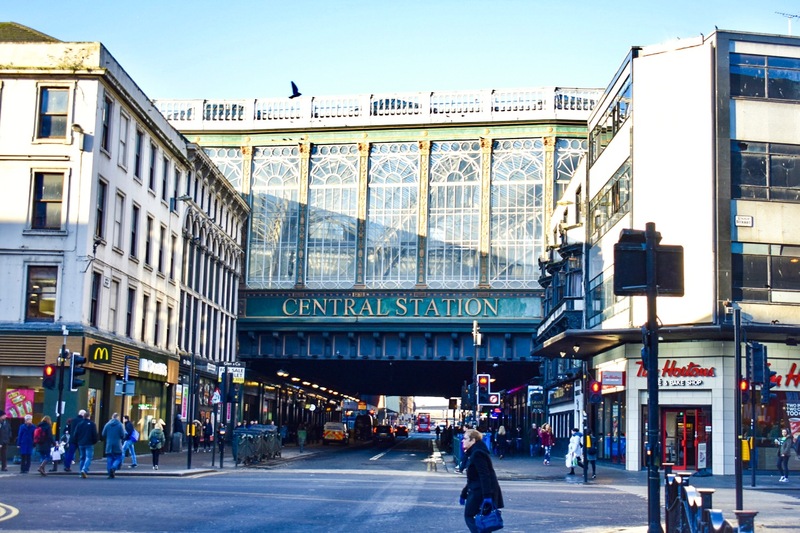 It’s also a short walk from St. Enoch’s Subway station on the Glasgow Subway. 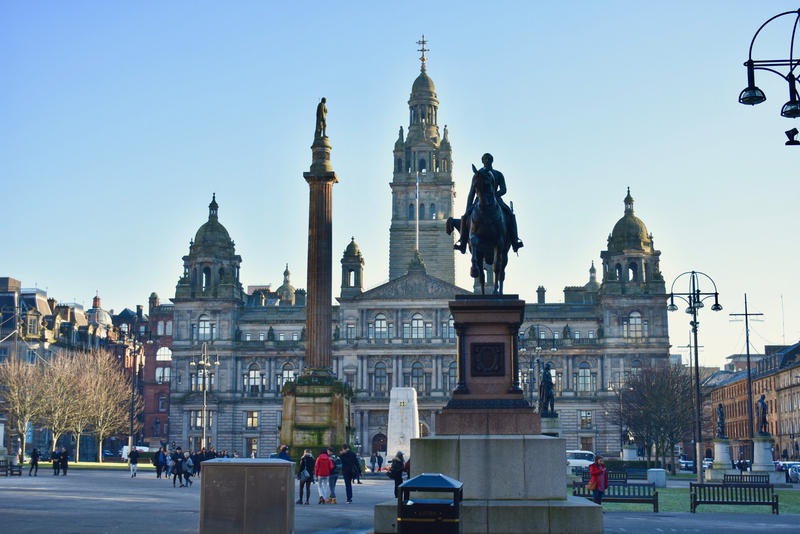 Otherwise, you’ll be flying into Glasgow into either of the two airports: Glasgow Airport or Glasgow Prestwick Airport, though the latter is used almost exclusively by Ryanair for destinations in warmer climbs such as the Canary Islands or Italy. Getting from Glasgow Airport is a relatively painless experience. 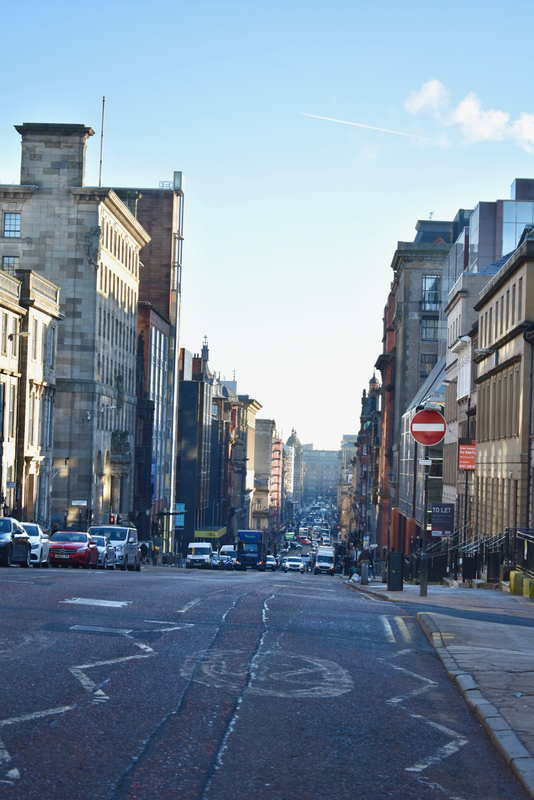 A taxi can be pre-booked using Glasgow Taxis, and costs about £20 to get into the heart of the city in about 20 minutes depending on the time of day. Alternatively, there is an express bus service to Buchannan Street for £8 single, £12 open return, which local bus services also operate. While there is a train near by, the station, Paisley Gilmour Street, is a mile away from the airport and requires a connecting bus to take you from A to B.
Disclaimer: We were invited to Glasgow on a two-day press trip by the City of Glasgow and some activities and meals (marked with *) were offered on a complimentary basis in order to cover on social media and spread the word. 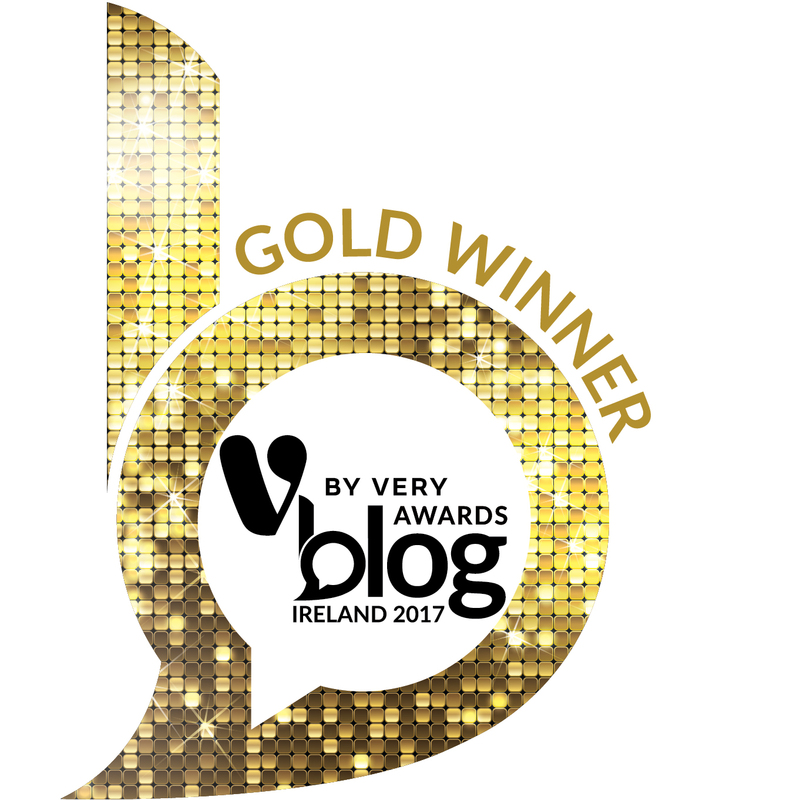 We were not asked to write a permanent blog post and we’ve chosen to do so because we’ve had such a great time and want to share all the tips and experiences we’ve amassed! 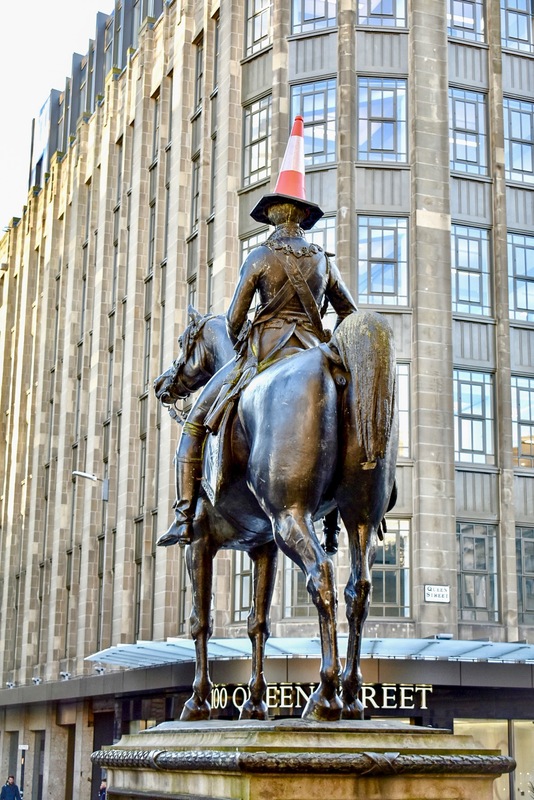 For further information on booking your trip to Glasgow, please visit PeopleMakeGlasgow.com.